A few months ago, I wrote a piece for GE Look Ahead, a project of The Economist Group, about the future of solar energy — particularly, costs and how “breakthrough” technologies could play into the story (or not). For the piece, I interviewed some of the leaders in the solar energy research realm. An initial draft of that article is republished below, along with an addendum from later conversations with Varun Sivaram, a former Stanford researcher who has led some important research on perovskite solar cells. Varun actually disagrees with the take-home message of the original article, so be sure to read the addendum for his thoughts as well. Hardly a day goes by without an announcement of another “breakthrough” in the labs of solar cell and solar panel researchers. From organic solar cells to multi-junction solar cells to black silicon to perovskites, there are many options beyond simple crystalline silicon solar cells that are exciting scientists in universities and research labs around the world. But what kind of a future do these competing options have? Will any of these new materials bring about a “next-generation” solar era? It’s all about price, of course. How cheaply can these various options produce electricity? How cheaply will they be able to produce electricity in 10 years? Fall of crystalline silicon photovoltaic solar cell costs from 1977 by Bloomberg New Energy Finance. Note that the price is even lower today. In an interview with Martin Green, PhD, one of the world’s preeminent solar scientists, I noted, “In recent years, we’ve seen a 22% reduction in solar module prices with each doubling of cumulative volume.” He responded, “Actually, since the 1980s. 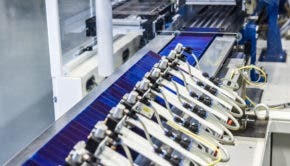 Plenty of scope for incremental cost improvements to continue this trend.” He highlighted projected shifts in silicon solar cells that will keep bringing down the price of this technology. For example, he stated, “Industry is currently transitioning from Al-BSF to PERC cell technology that will allow mainstream cell efficiencies to increase over the next few years from 17-19% to 19-22% and perhaps on to 25%.” This falls in line with Jenny’s comments about how the cost of solar panels will get down to 21 cents by 2040. But none of it concerns perovskites, graphene, or other “breakthrough” materials. It’s all about improving on a dominant technology in what now seems to be a rather mature industry. “We no longer need a breakthrough to achieve one,” an anonymous and keen observer of the industry noted to me. That is the story in a nutshell.